David Coverdale apparently has no difficulties letting go of things associated with fortune and fame. After walking away from Deep Purple early in his career he disbanded his brainchild Whitesnake at the height of their success in 1990 only to regroup and dissolve the band once again less than a decade later. Fortunately for his followers, Coverdale can’t seem to stay away from the microphone for too long. Last Thursday night, "DC," as fans affectionately call the eloquent rocker, blew away the audience at San Francisco’s Regency Ballroom confirming the long-held suspicion that it can only be his true passion for making music that keeps him coming back for more and more. Right around 9 PM, Coverdale and bandmates exploded onto the stage with opener “Burn,” a track from their latest studio release “The Purple Album,” a compilation of remakes of Deep Purple songs and tribute to Coverdale’s former collaborators. Whitesnake original “Slide It In” followed without hesitation, and fans temporarily relieved the singer from his job as he proudly pointed the mic toward the audience. At this early point in the show the energy already reached a level of intensity many bands only hope to achieve during their encore. Coverdale, who was dressed in a white, buttoned down shirt and black leather pants, projected pure confidence. He was on fire, effortlessly conjoining bold raunchiness with the poise of a seasoned rock star. Throughout the evening, the British born frontman took full advantage of his power by toying with fans in the front rows and elegantly raising a toast with a glass of wine. 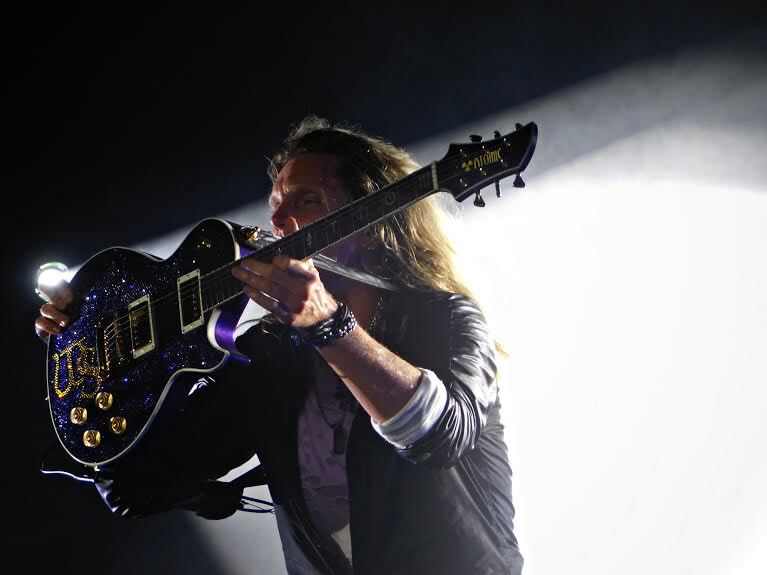 After a whirlwind of alternating Whitesnake compositions and Deep Purple remakes, the audience was in for a special treat as equally talented guitarists Reb Beach and Joel Hoekstra delivered brilliant solos. While Beach, who splits his time between Whitesnake and Winger, dominated his instrument in a heavy, forceful, yet intricate manner, Hoekstra appeared to be hugging his blue glittery six-string creating an effortlessly flowing, almost angelic resonance. The skill level was exceptional, but what made these presentations truly magnificent was the notion that they could simultaneously exist on one stage without evoking the slightest need for a comparison. After two more Deep Purple classics it was time for veteran drummer Tommy Aldridge to take the spotlight. The double bass pioneer beat his drums with such ferocity that left stunned spectators exhausted from merely attempting to study his moves. Just when it appeared as if the tension couldn’t soar any further, Aldridge threw away his sticks and proceeded to drum with his bare hands, which has become one of his trademarks throughout his phenomenal career. Newer members proved to be invaluable as well. Bassist Michael Devin, who has been with Whitesnake since 2010, delivered a solid performance and demonstrated great showmanship playing harmonica during “Mistreated.” Latest addition “Italian Stallion” and renowned voice coach Michele Lupi played an important role on keys and lend his expertise to the back-up vocals. While songs from “The Purple Album” were well received the crowd really went wild during “Is This Love” and “Here I Go Again.” The latter closed the set and the band quickly disappeared into the dark. Fortunately, drained fans didn’t have to scream for long before the sextet reappeared determined to do the seemingly impossible by turning up the heat one more notch with “Still of the Night,” very likely one of the greatest rock songs ever written. What happened that evening when Whitesnake took the stage at the Regency Ballroom perfectly illustrated the difference between a great show and a truly magical experience. The energy was so intense words don’t appear capable of producing an adequate description. However, one thing was certain: this was pure rock ‘n’ roll performed by true masters of their craft.